чем хотел вложить в неё автор. 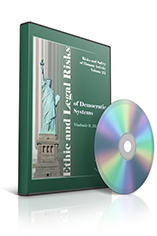 The purpose of the monograph is to develop the criteria for assessment of ethic and legal risks of democratic systems, resulting from violation of the norms of ethics and the legal norm. This violation distorts the goals and methods of achieving goals inherent in democratic systems, creating society crises and catastrophes, first spiritual, and then material as a result. It is demonstrated that in order to prevent crises and catastrophes, it is necessary to create the structures of power systems, which realize maximum efficiency and minimize risks of human activities.